The Hereditary Right of the Crown of England Asserted; the History..
1713. "The True English Constitution Vindicated" [Harbin, George]. The Hereditary Right of the Crown of England Asserted; the History of the Succession Since the Conquest Clear'd; And the True English Constitution Vindicated from the Misrepresentations of Dr. Higden's View and Defence. Wherein Some Mistakes also of Our Common Historians are Rectify'd; And Several Particulars Relating to the Succession, And to the Title of the House of Suffolk, Are now First Publish'd from Ancient Records and Original MSS; Together with an Authentick Copy of King Henry VIII. 's Will. By a Gentleman. London: Printed for Richard Smith, At Bishop Beveridge's Head in Pater-Noster-Row, 1713. [viii], 274; lxiii,  pp. Includes five-page publisher catalogue. Folio (12-1/2" x 7-1/2"). Contemporary paneled calf, rebacked retaining existing spine, corners mended, endpapers renewed. Light rubbing and some minor scratches and tiny scuffs to boards, moderate rubbing to extremities, corners bumped. Moderate toning, somewhat heavier in places, faint dampstaining to margins, some chipping to margins of final five leaves. A handsome copy. $850. 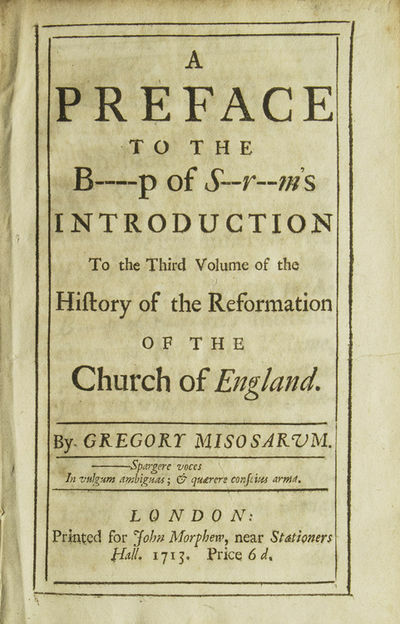 * Only edition, one of two issues from 1713. This vigorous argument in support of the restoration of the Stuart succession is a reply to the pro-Hanoverian argument advanced in William Higden's A Defence of The View of the English Constitution with Respect to the Sovereign Authority of the Prince, And the Allegiance of the Subject (1710). George Ridpath replied to Harbin with a defense of Higden titled Parliamentary Right Maintain'd or the Hanover Succession Justify'd (1714). Some sources attribute Harbin's book to Hilkiah Bedford, who probably edited it and saw it through the press, and, erroneously, to Charles Leslie. 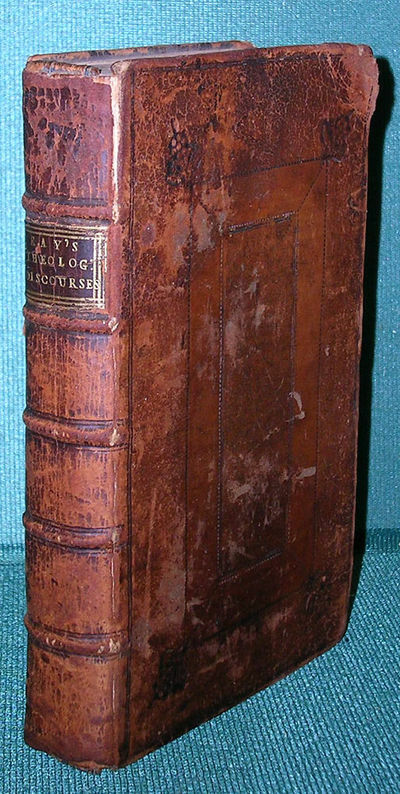 English Short-Title Catalogue N17449. London: William Innys. VG. 1713. 3rd Edition. Full-Leather. Third edition which is enlarged from the previous editions with additi ons from the author's manuscript. Bound in full embossed calf leather with five raised spine bands and a red leather title label stamped in gilt on the spine. Frontis plate of Ray and three additional copper en gravings of coins of the ancient Greeks and Romans, fossils, and bone artifacts. 8vo size, 456pp. A Very Good copy. The leather has small ru b spots to the corners and spine tips. Short crack at the front seam n ear the head of the spine. Upper rear corner rubbed and rounded. Small bookplate of Varnum Hull on the front endpaper. Mild foxing and tonin g to the pages. The interior is tight and unmarked. Text includes I. T he primitive chaos, and creation of the world. II. The General Deluge, its causes and effects. III. The Dissolution of the world and future conflagration. . Le Nouveau Theatre d'agriculture et menage des champs, contenant la maniere de cultiver & faire valoir toutes sortes de biens a la campagne, avec une instruction generale sur les jardin fruitiers, potages, jardins d'ornements & botanique, & sur le commerce de toutes les marchandises qui proviennent de l'agriculture; le tout suivi d'un traite de la peche, & de la chasse: extrait de fouilloux, & des meilleurs auteurs. Ouvrage tres utile dans toutes les familles. Par le Sieur Liger. Enrichi d'un grand nombre de figures en taille douce. A Paris au Palais: chez Damien Beugnié dans la grande salle au pillier des consultations, au lion d'or, 1713. 4to (250x185 mm); leg. in piena pelle marrone scura, dorso a 5 nervi, titoli e fregi in oro al dorso (legatura leggermente consumata alla cuffia superiore e agli angoli, qualche graffio); pp. (16), 740; 29 incisioni in b.n. f.t. illustranti uomini e donne impegnati in ogni sorta di attività agricole e della vita agricola, tra cui giardinaggio, apicoltura, allevamento, potatura, vinificazione, ecc., ed alcune piante di giardini; frontespizio in caratteri neri e rossi; marca tipografica al frontespizio; belle testatine, finalini e capilettera inc. in b.n. ; dedica dell'autore a Monsieur Decotte, Conseilleur du Roy. Rara prima edizione di questo bel compendio su tutti gli aspetti della vita di campagna, organizzato in cinque parti: gestione della casa; allevamento; colture; cucina; frutti e giardini fioriti. Louis Liger (1658-1717) è stato un valente agronomo francese; ha scritto una serie di libri sui fiori, il giardinaggio e l'agricoltura, compreso questo. -- 29 b&w plates showing people engaged in activities of rustic life: gardening, bee-keeping, husbandry, pruning, winemaking, etc., plus a number of garden plans. Liger wrote a number of books on flowers, gardening and agriculture including this one, a compendium on all aspects of country life arranged in five parts: household management; husbandry; crops; cookery; and the fruit, kitchen and flower gardens. The plates show men and women engaged in all sorts of agricultural and farm life activities. Full calf with original calf sides, leaves lightly browned. -- Rif. 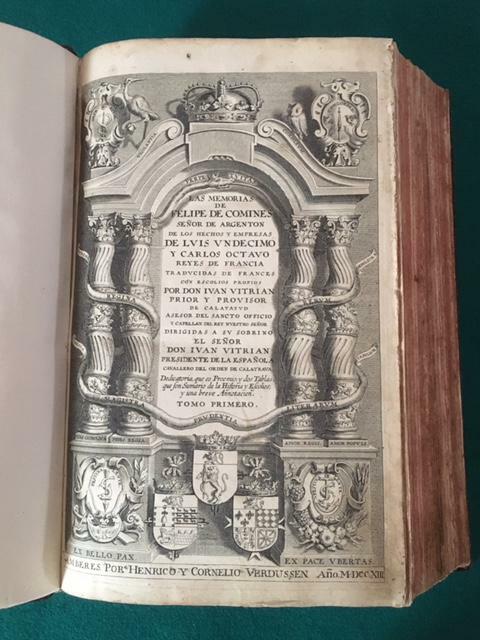 : Edizione non censita presso le Biblioteche italiane, dove invece è presente l'edizione di Parigi, chez Michel David, quay des Augustins, a la Providence, pubblicata lo stesso anno e con stessa identica collazione (IT\ICCU\VIAE\000023). OCLC, 490196809. Cond. : Opera in ottime condizioni generali, con leggere bruniture alle carte, ma le incisioni sono perfette. Leaves lightly browned. 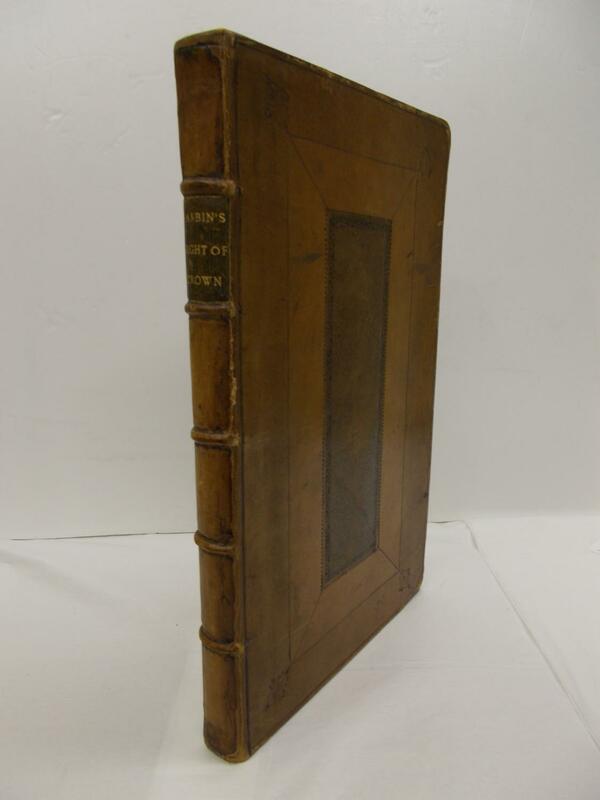 Very good copy with engravings in perfect condition. Jus civile controversum, ubi illustriores juris controversiae breviter et succincte deciduntur, difficiliores materiae explicantur, objectiones solide solvuntur, et legum dissensus nova saepe ratione, ubi hactenus satisfactum non videtur, conciliantur. Opus ad illustrationem compendii Lauterbachiani. Editio altera multis quaestionibus aucta. 2 Bde. in 1. 4 Bll., 968 S. 2 Bll., 764 S., 68 Bll. Mit 2 gest. Titelvign. Pgt. d. Zt. ADB IV, 373f. 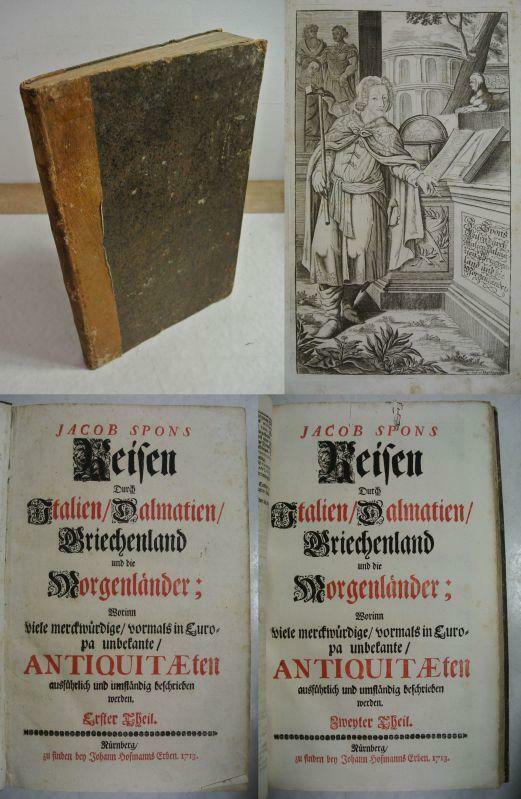 Zweite Ausgabe des zunächst 1713-18 erschienenen Werkes, "in welchem er nach der Ordnung des Lauterbachschen Compendium juris die wichtigsten Controversen des Civilrechts in kurzen Sätzen nach den Quellen und naturrechtlichen Erwägungen erörterte". - Einband fleckig u. angeschmutzt. Vorderes Innengelenk schwach. Vorsätze knitterig. Vereinzelt braunfleckig u. gebräunt. 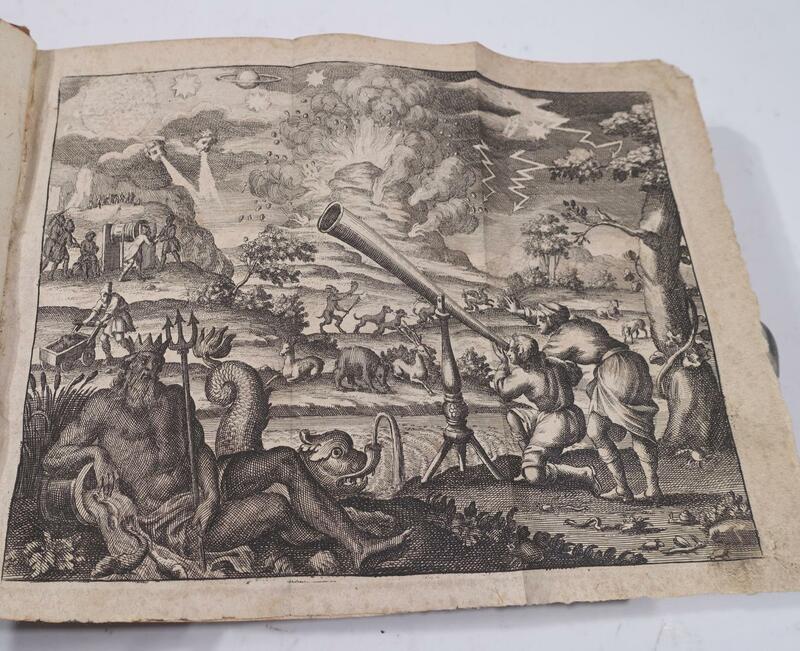 1713 - 14.5 x 20.7 cm. 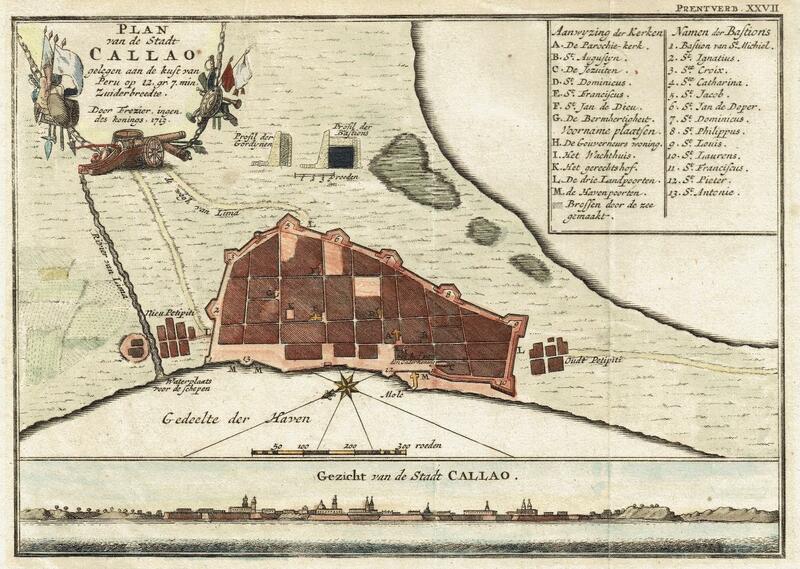 Muy buen ejemplar del importante mapa de Callao levantado en 1713 por Amédée François Frézier. Éste era un oficial ingeniero de su majestad el rey de Francia que había tenido un papel militar significativo durante la guerra de sucesión de España. En 1711, el gobierno español lo contrató para evaluar la eficiencia de las fortificaciones de los puertos de Chile y Perú. En particular, las autoridades coloniales buscaban frenar el contrabando que afectaba las finanzas de la región y mejorar la protección de los puertos (cf. Mariselle Meléndez, "Geographies of Patriotism: A South American Port in the Age of Enlightenment", in Vanderbilt e-Journal of Luso-Hispanic Studies, junio de 2014). Otras fuentes aseguran que Frézier, quien llegó a Callao, el puerto de Lima en 1713, era más bien un espía francés enviado por Luis XIV. En este mapa se nota la precisión de la cartografía: detalla de forma muy minuciosa la cuidad, con una leyenda de 26 puntos &#150; los 13 baluartes, las iglesias y los conventos, el palacio del gobernador &#150; y un perfil de las murallas y de los baluartes (arriba). En la parte inferior del mapa se aprecia un perfil de la vista de Callao. Este grabado está fechado en 1713, fecha del levantamiento, y fue publicado en la edición holandesa de la relación de viaje de Frézier (Relación del viaje por el Mar del Sur), alrededor de 1718. En dicha relación, Frézier describió a la ciudad como: "la más Hermosa y la más segura de todo el Mar del Sur. El mar está siempre tan tranquilo que los navíos carenan allí en cualquier época sin temor a ser sorprendidos por una ráfaga de viento". Tanto este mapa como el del padre Louis Éconches Feuillée, parecen ser los primeros mapas impresos de Callao. Feuillée, un botánico y cartógrafo francés, había visitado La Plata, Chile y Perú en 1709-1710, y realizó también mapas de varios puertos de la región. Los mapas de Frézier, levantados tres años después de los de Feuillée, no se inspiran en los anteriores y son mucho más detallados y precisos. De hecho, los mapas de Frézier y en particular éste de Callao, sirvieron de modelo para los mapas de Bellin publicados en los años 1750 y 1760. Los mapas de Frézier son especialmente escasos, el AMPR sólo menciona la venta de los mapas de Concepción, Arica, Lima, Santiago y Valparaíso (en su versión francesa) en la década de 1980. Se ubicó también la venta en subasta de la versión francesa del mapa de Callao en 2014. No hemos logrado ubicar el Plan van de Stadt Callao en ninguna colección particular o pública. El mapa se encuentra en excelente estado, con colores de época. Austheilung von dem Überschuss der alten löblichen Königl. Gross-Britannischen auch Chur- und Fürstl: Braunschw: Lüneb. Bergwercke, als Zellerfeldt, Wildemann, Grund und Lauthenthal, etc. 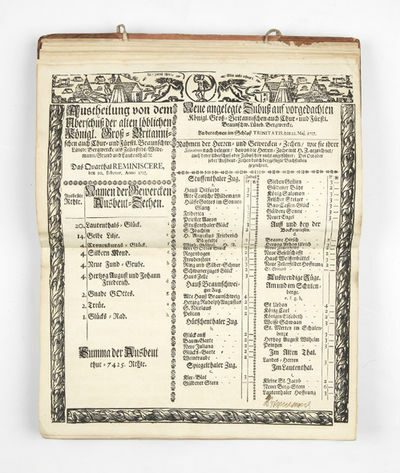 Series of 56 printed quarterly forms from 26 August 1713 to 10 May 1727, each measuring 380 by 315 mm. & folded horizontally. Letterpress text in three columns within a four-part woodcut border, the bottom & side borders purely ornamental, the upper part containing mining & allegorical motifs and the letterpress admonition "Wer Zubuss scheut - wird nicht erfreut" i. e. "He who avoids the deposit will derive no joy from it." Most forms have been signed by a mining clerk. Mounted on guards and bound in cont. half-sheep & pink boards, with three (of four) deerskin ties & manuscript label to upper cover "Zellfeldsche BergZettels." 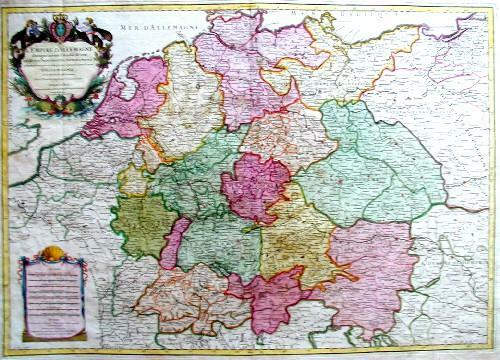 [Zellerfeld]: 26 August 1713-10 May 1727. The towns of Zellerfeld, Wildemann, Grund, and Lauthenthal were four of the most important mining centers of the Upper Harz Mountains, once one of the greatest mining regions in Germany. Mining has been carried on there since the middle of the 10th century, primarily for silver, but also for lead, gold, copper, iron, sulphur, alum, and arsenic. 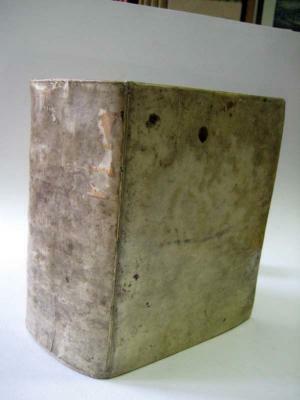 In this volume, 56 printed forms have been bound together consecutively, each with a successive quarterly date (26 August 1713, 25 November 1713, etc.). 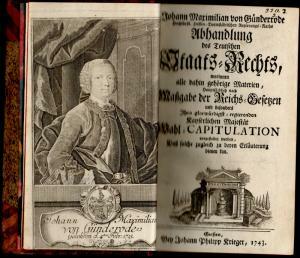 The quarterly sheets record the accounts of profits or losses of the upper Harz silver mining corporations. Early mining law stipulated that shareholders (Gewerken) were liable for the losses incurred by their mine and had to deposit a collateral (Zubusse) corresponding to their share (Kuxe). The amount due was calculated anew for each quarterly period and recorded here on each form. The forms also record the distribution of the surplus funds to shareholders. The columns on the right side of the sheet lists individual guilds and other shareholders including several dukes (for example, Augustus Wilhelm, Duke of Brunswick-Lüneburg). An important and unique collection, recording the activities of these mines and the business of mining. typis. Sem. apud Joannem Manfrè, 1713. Cm. 17, pp. (8) 245 (27). Legatura coeva in piena pergamena rigida con titoli ms. al dorso. Sporadiche fioriture e macchiette. Ben conservato. Antonio Bombardini (1666-1726), nobile padovano, fu per quasi trent'anni professore a Padova (diritto canonico, criminale e civile). Quest'opera è dedicata monograficamente alla storia delle carceri antiche, al loro uso e all'evoluzione degli istituti; la dottrina esposta è reputata dottissima negli antichi repertori bibliografici, anche perché (come riporta il Giornale de' letterati d'Italia) fu il primo trattato dedicato a questo interessante argomento. Rarissima prima edizione. Cfr. Iccu; Brunet, I, 144 "Vol. peu commun"; Giornale de' letterati d'Italia (ed. 1740, vol. 40, p. 225-226)..
Den retfærdiges u-overvindelige frimodighed/ i Guds og sin samvittigheds vidnisbyrd forestillet og sammenskrevet til et vel-fortient ære-minde over den fordum høj-ædle og velbaarne nu hos Gud salige herre/ herr Knud Tott herre til Knudstrop og Gaunøe. København (1713). 4to. 1800-talls helshirtingbd. med skinn tittelfelt. (40) + 352 + 16 s. Stort, foldet kobberstikk. Treskårne vignetter. Bindet plettet. Navn på forsatsbl. 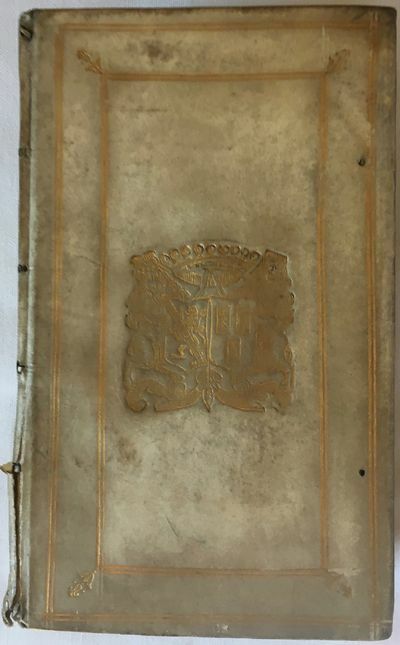 Kobberstikket forsterket i margene.. .
Memoires du Maréchal Duc de Richelieu, pour servir à l'Histoire des Cours de Louis XIV, de la minorité et du Règne de Louis XV, etc. etc. ex officina Zunneriana, sumptibus Johannis Adami Jungii, 1713. Quattro tomi in due volumi di cm. 35, pp. 2.400 ca. complessive. Belle vignette incise in rame ai frontespizi, tra cui segnaliamo una veduta di città al primo frontespizio bicromo. Bella legatura coeva in piena pergamena rigida, dorso a 5 nervi con titoli manoscritti e impressioni floreali impresse a secco al centro dei piatti. Mancanza di pergamena limitata alla parte alta di un dorso, naturali bruniture tipiche della carta tedesca del tempo, macchiette sparse; qualche marginale alone. Nel complesso esemplare ben conservato. Melchior Goldast von Haiminsfeld (1578-1635), celebre filosofo e pensatore politico di origini svizzere, iniziò la sua carriera universitaria ad Ingolstadt per poi trasferirsi prima ad Heidelberg ed infine a Francoforte. Fonte di assoluta importanza storico-giuridica. Si tratta dell'edizione più rara e completa in materia di raccolte di costituzioni imperiali. Cfr. Kvk..
per Pellegrino Frediani, 1713. 4to (cm. 21,7), 10 cc.nn., 184 pp. Antiporta figurata e 4 tavv. f.t. in fine. Vignetta xilografica al frontis. Legatura in mz. pergamena con piatti in carta policroma settecentesca (leggermente usurata). Titolo ms. al ds. Ottimo esemplare, assai fresco fatta eccezione per due carte dellâ€™Indice brunite. Rara edizione originale. Provenienza: collezione Piero Frati. Lozzi II, 3637; Moreni I, 148. London.George Strahan. 1713. [iv],1-131pp. Recent quarter calf gilt over marbled boards with vellum-tipped corners. Octavo. First edition. Some browning to pages. Else, a very good copy.An attack on Anthony Collins' book 'Free-Thinking' published the same year. Compendioso ragguaglio delle solenni feste celebrate nella cittÃ di Torino, nel radoppiato giubilo per la dichiarazione della pace, e della esaltazione del reale sovrano Vittorio Amedeo al trono della Sicilia. In Torino, per Pietro Giuseppe Zappata, stampatore dell'illustrissima città, 1713. in-8, pp. 58, (2, bianche); legatura coeva in pergamena floscia, capitelli passanti: entro astuccio in carta decorata con duplice tassello cartaceo al dorso: uno con titolo l'altro con collocazione della Biblioteca di Vittorio Emanuele III. Ai fogli C1-G5, con frontespizio proprio: Orazione detta nel giorno precedente alla partenza della regia maestà di Vittorio Amedeo verso il Regno della Sicilia, ... dal padre C.M.Audiberti ...Rarissimo libro di feste torinese, illustrato da 2 tavole ripieg. incise da Tasniere raffigurante la Macchina dei fuochi in pianta e in veduta frontale. Il presente volumetto descrive i festeggiamenti torinesi voluti dal Comune tra gli ultimi giorni di luglio e i primi di agosto del 1713. Vennero allestite due cerimonie: la prima prevedeva l'illuminazione del Palazzo di Città e la recitazione di un Te Deum nella chiesa del Corpus Domini, la seconda venne organizzata dal Consiglio comunale per celebrare il nuovo Re. Espressione del legame tra la Municipalità e il sovrano, le feste evidenziano -accanto alla tradizionale piazza delle Erbe prospiciente la sede comunale - piazza Castello, scelta per allestirvi una macchina di fuochi d'artiﬁcio di forma triangolare, simbolo della Sicilia. Provenienza: al contropiatto dell'astuccio ex libris "Vittorio Emanuele III di Savoia". Rara edizione censita in sole 12 Biblioteche Pubbliche Italiane. . .
Antiquitatum Romanarum libri quatuor. Quibus continentur Res Sacrae, Civiles, Militares, Domesticae... Editio novissima...emendata, cui accesserunt...Justi Lipsii Opuscola Rariora. Lugduni Batavorum: Petrum Vander Aa, 1713. Book. Very good condition. Hardcover. First Edition. Octavo (8vo). [xxviii] pages, 684 pages of text. Complete with 33 engraved plates including the frontis, an engraved title, 15 in-text full page illustrations, and 16 plates including 15 of which are fold-out. Two of the folding plates are torn with no loss. A few pages with minor creasing to the corner. There are numerous additional in-text illustrations that consume are two thirds of a page, half page, quarter page, or smaller, most of which are numismatic. Two small spots of staining affecting a few pages of text. Plates show Roman dress and military ground troop strategy. Full original vellum binding with moderate soiling and minor wear; hand-lettered boldly and attractively on the spine. Title printed in red and black. Previous owner's name in a tiny script on a front endpaper: Ex Libris J. DeBonne. .
1713 - copper engraved plate with recent hand colouring; overall size 51 x 44 cm (cropped); plate size 49 x 40 cm. 3rd edition. text on verso.- A magnificent print from the &#145;Hortus Eystettensis&#146; [The Garden of Eichstatt], one of the most amazing botanical books of the 17th century ever produced!- Basilius Besler, an apothecary and botanist from Nurnberg, was the curator of the prince bishop, Johann Konrad von Gemmingen, of Eichstätt in Bavaria. The bishop took great pride in the gardens of his palace, Willibaldsburg, which rivalled other magnificent gardens in Europe, and asked Besler to compile a codex of all the plants growing there which, initially, was started in 1596 and designed by Joachim Camerius the Younger (1534-1598). It took Besler 16 years to complete the task; unfortunately, the bishop died weeks before the publication of the Hortus. - The garden was sacked by Swedish troops in 1633/4 during the 30 Year War but re-opened in 1998 after reconstruction, following closely the outline of the book.- What makes the Hortus so unique is that instead of portraying medicinal or culinary plants, the emphasis was on garden flowers, herbs, vegetables and exotic plants. These were depicted almost life size with great detail, and arranged artistically and pleasing to even the modern eye, with an average of 3 plants on one sheet. This arrangement made up a total of 1084 plants on 367 copper engravings on 368 large folio sized sheets. - First published in 1613, 300 copies were printed which took over four years to sell. 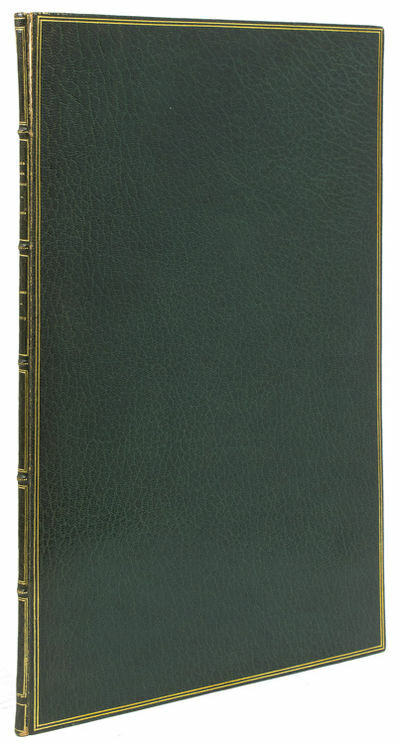 Two version were produced of the first edition: one with text on verso of the plant print, intended as reference books; the second without text, on quality paper and lavishly hand-coloured, used as presentation or subscriber copies. In 1640 and 1713, two further editions were published. - The luxury version sold for an exorbitant 500 florins, while the plain, uncoloured copies went for 35 florins each. 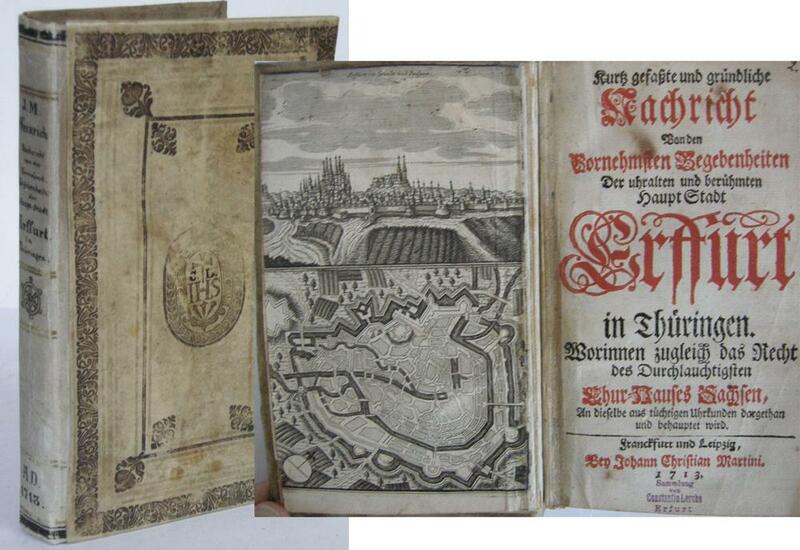 Besler could finally purchase a comfortable home in a fashionable part of Nürnberg at a price of 2 500 florins &#150; five coloured copies' worth of &#145;Hortus Eystettensis'!- de Belder 23, 24, 25; Nissen 158- Paper oat meal coloured; light horizontal centre crease (due to drying on a line); additional smaller printer&#146;s creases; one vertical slight crease on ;ower right part; some text off set from verso; stitch holes in right margin; minor marginal tears; remnants of old paper hinges and repair tape on verso; rust spots; right margin 4 cm long tear, repaired with tape, into image, but hardly visible; o/w vg cond. uvres de Nicolas Boileau Despréaux. Abhandlung des Teutschen Staats-Rechts, worinnen alle dahin gehörigen Materien, hauptsächlich nach Maßgabe der Reichs-Gesetzen und besonders Ihro glorwürdigst-regierenden Kayserlichen Majestät Wahl-Capitulation, vorgestellet werden : daß solche zugleich zu deren Erläuterung dienen kan.
Günderrode (1713-1784) war hessen-kasselischer Geheimrat Rentkammer- und Regierungsdirektor. 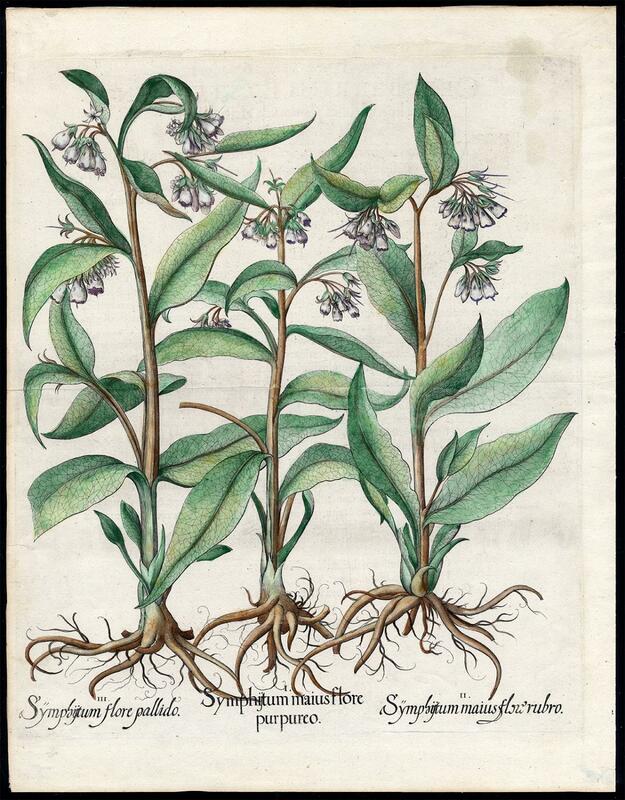 Antique Print-SYMPHIITUM MAIUS FLORE PURPUREO-PALLIDO-COMFREY-Besler-1713 ed. - Plate : 'Symhiitum maius flore purpureo - rubro - pallido.' (Comfrey - Mauve Flowered Comfrey - White Flowered Comfrey). Engraving / etching on a verge type of hand-laid paper with later hand colouring. Description: This original antique print originates from 'Hortus Eystettensis' by Basilius Besler, originally published in Germany in 1613. Later ed. 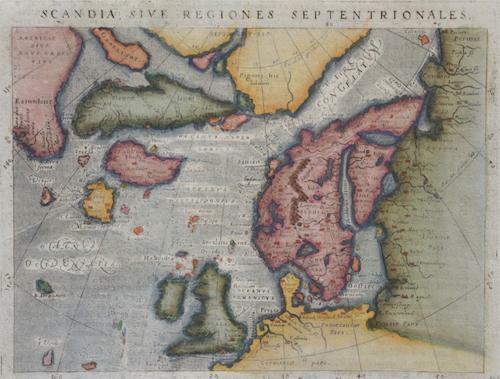 in 1640 and 1713. This is probably from a 1713 ed. (Based on text shining slightly through. 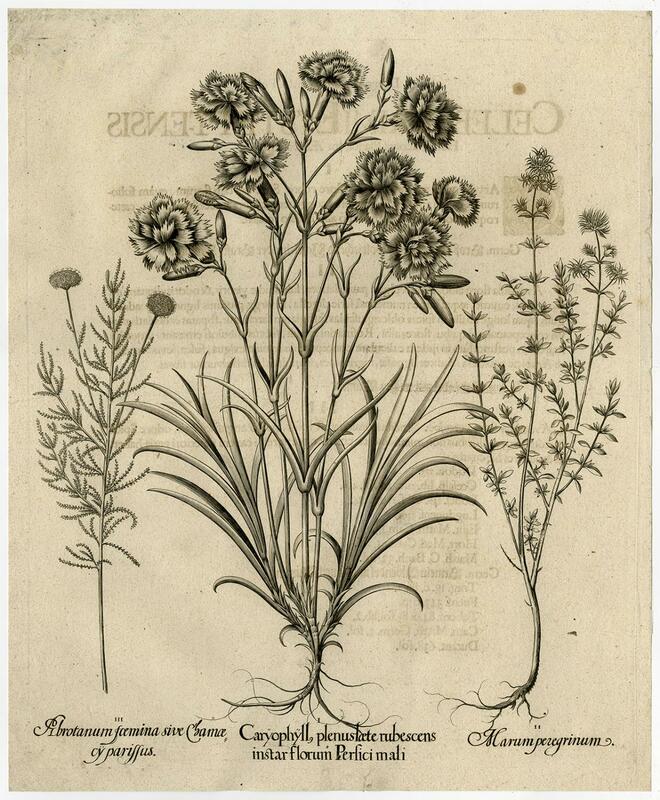 )Artists and Engravers: Basilius Besler (1561 - 1629), a respected apothecary and botanist from Nuremberg, Germany. He is best known for his momumental large folio botanical work 'Hortus Eystettensis' with 374 copperplate engravings. These prints, made by a team of master engravers, are strong and exquisitely done. Storage location: DP-B6-39 The overall size is ca. 16.9 x 22 inch. The image size is ca. 15.7 x 19.3 inch. The overall size is ca. 43 x 56 cm. The image size is ca. 40 x 49 cm. - Antique Master Print, titled: 'I. Caryophyll, plenustaete rubescens instar florium perfici mali. II. Marum peregrinum. III. Abrotanum foemina sive Chamoe, cyparissus.' - Prints shows three flowers with roots: I. Red-flowering Carnation, II. Thymus mastichina, III. Lavender-cotton. Copperplate etching / engraving on laid paper. Made by 'R. Custodis' after 'Basilius Besler'. Raphael Custos (1590-1664) was a German engraver from the Custos / Kilian family of engravers from Augsburg. His father was the Flemish Domenicus Custos / Custodis (c. 1560-1612), who married the widow Kilian in Augsburg. His brothers David and Jacob were engravers as well. Basilius Besler (1561 - 1629), a respected apothecary and botanist from Nuremberg, Germany. He is best known for his momumental large folio botanical work 'Hortus Eystettensis' with 374 copperplate engravings. These prints, made by a team of master engravers, are strong and exquisitely done. Condition: Excellent, given age. Stain in right top of print. Small tear in margin and paper erosion on the plate mark in right margin, remargined using contemporary paper backed with acid free archival tape. 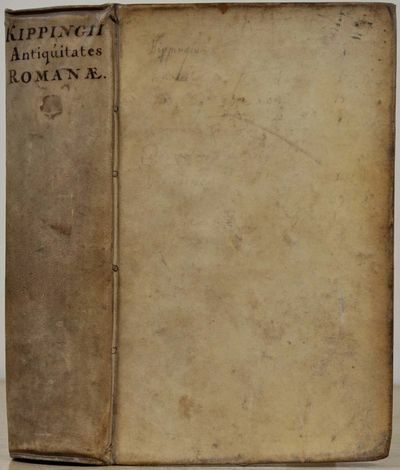 Ghosting from the text on the verso. General age-related toning and/or occasional minor defects from handling. Please study scan carefully. The overall size is ca. 16.7 x 20.3 inch. The image size is ca. 15.7 x 19 inch. The overall size is ca. 42.3 x 51.5 cm. The image size is ca. 40 x 48.2 cm. Lugduni Batavorum:: Apud vid. C. Boutesteyn & S. Luchtmans, Delphis, Apud Adrianum Beman., 1713. Full Vellum. Good. 8vo.. Two volumes in One. , 862,  p., 2 l., , 3-224 p., 14 leaves of plates (8 folded) : ill., maps, port. Original Vellum. Lacks title-page to Vol I. Both boards have two doubled ruled borders in gilt, armorial design in gilt at the centre of both panels. The spine has 5 double ruled compartments in gilt, a gilt rose in the bottom 4, gilt titling in the top compartment. Some bumping, marking & discolouration, more so to the spine. The bottom right hinge is split up-to the 2nd compartment, slight loss. Page block edges soiled. Pastedown is loose, initials of P.J.F. Page edges tanned, some spotting. Extensive footnotes with references. Text - Latin These commentaries are Julius Caesar's first hand account of the Gallic Wars. FALCONE Nicolò Carminio. L'intera istoria della famiglia, vita, miracoli, traslazione e culto del glorioso martire S.Gennaro, Vescovo di Benevento, Cittadino e Principal Protettore di Napoli. In Napoli, nella Stamperia di Felice Mosca, 1713. In 4to; pp.20 n.nn., 526. Antiporta allegorica ripetuta 5 volte all'inizio di ciascuno dei 5 libri di cui l'opera è composta. 8 tavole a piena pagina, una figura nel testo a mezza pagina. Frontespizio a caratteri neri e rossi. Foro da tarlo al margine inferiore destro delle prime carte senza perdita di testo. Mezza pergamena posteriore, titolo in nero al dorso. Lozzi, 3016; Minieri Riccio, Scrittori, pag.121; Furcheim, Bibl. del Vesuvio, pag.53. Carte de la Souveraineté de Neuchatel et Vallangin, dressée sur les Mémoires du Sr. D. F. de Merveilleux. Mcin. Rectifiés par les Observations de l?Academie Royale des Sciences. 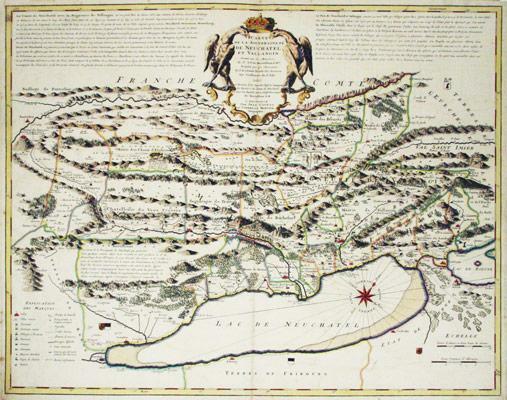 Vers 1713, - 49 x 64 cm, carte gravée coloriée à la main, pli central, papier légèrement bruni, déchirures marginales, 1 feuille (54.5 x 65.5 cm). Carte publiée dans: Guillaume de Lisle, Atlas nouveau, contenant toutes les parties Du Monde, où sont exactement remarqués les empires, monarchies, royaumes, états, républiques, &c. Premier Géographe de Sa Majeste, Amsterdam, Chez Jean Covens & Corneille Mortier.Please notify before visiting to see a book. Prices are excl. VAT/TVA (only Switzerland) & postage. Froidevaux, Bibliographie neuchâteloise, 323. 12 folding engraved plates with 37 figures of fireplaces and designs.12mo. ff. 267pp. ff. Contemporary sprinkled calf, ornamental gilt spine. morocco label. Las Memorias de Felipe de Comines, Señor de Argenton, de los hechos y empresas de Luis undécimo y Carlos octavo Reyes de Francia. Traducidas de francés con escolios propios por don Iuan Vitrian, prior y provisor de Catalayud. Tomo Primero y Tomo Segundo. I. Muscari obsoleto albo flore. II. Muscari floribus, III. Hyacinthus stellaris Bizantinus. Nuremburg 1713 - Copper-engraving, with fine hand colour. Dimensions: 535 x 425mm. 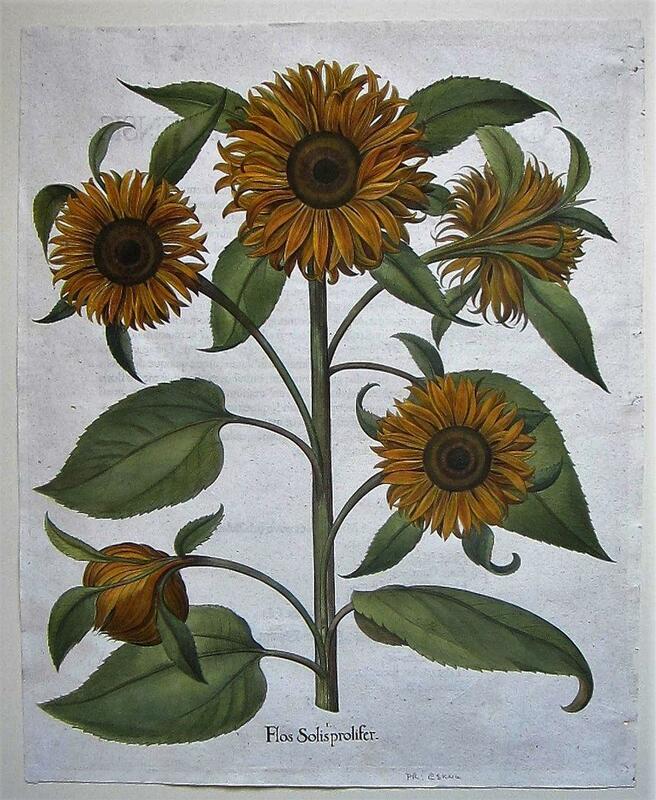 (21 by 16.75 inches) A magnificent plate from "Hortus Eystettensis", one of the earliest and most famous works in the field. 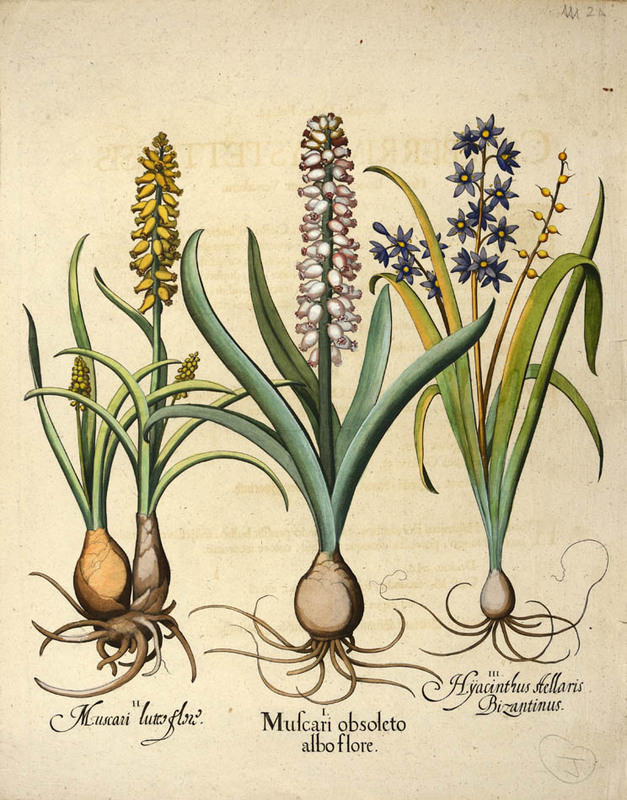 The Hortus Eystettensis is a pictorial record of the flowers grown in the greatest German garden of its time, that of Prince Bishop of Eichstatt, Johann Conrad von Gemmingen. The garden was begun by Joachim Camerarius in 1596 and, after his death in 1598, completed by Basil Besler, a pharmacist from Nuremberg. A visitor, Philipp Hainhofer, in 1611 marvelled at the eight gardens, each containing 'flowers from a different country; they varied in the beds and flowers, especially in the beautiful roses, lilies, tulips.' The Hortus records this variety and beauty. The book is exceptional in every sense; in its variety and range of flowers, in its size, in its fine quality of engraving. It is also one of the earliest records of flowers from a specific, documented garden. Besler was asked to complete the work by Gemmingen in 1606; the huge nature of the task was clear to Besler and he enlisted the help of his younger brother Hieronymus and Ludwig Jungermann, a nephew of Camerarius. Printing the Hortus may have begun as early as 1607. Drawings were made in situ and from specimens sent by the Bishop to Nuremberg; the Bishop reported to Hainhofer that he had boxes of fresh flowers sent every week to Besler at Nuremberg for sketching. A team of at least 10 engravers were employed to translate the drawings to copperplates. The gardens, along with most of the town of Eichstatt, were destroyed by the invading Swedish troops under Herzog Bernhard von Weimar in 1633-4, although they were partially restored by later bishops. Many of the original drawings survive in the University Library, Erlangen.